Undoubtedly one of the most influential bands of the 20th century and loved by many all across the globe, Pink Floyd produced an audio/visual experience very few artists could match. 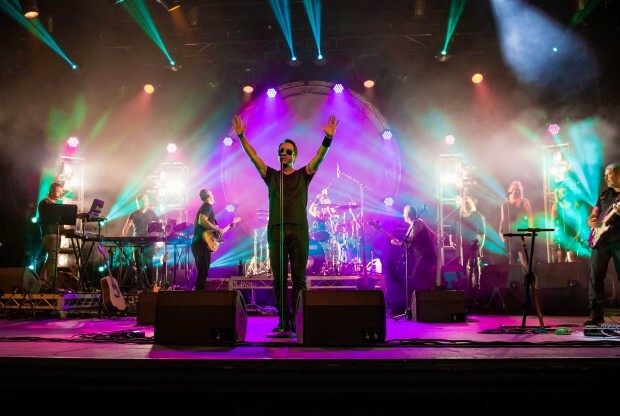 Tribute band Echoes of Pink Floyd try their best to replicate and bring the incredible experience that captivated fans worldwide into the modern era, in which they succeed. Starting off with a bang, vocalist Matt Goodluck entered, claiming the stage with undeniable confidence and a demeanour only a front man could achieve. But Matt would not be alone in trying to replicate the experience, the entire band maintained an energy right off the bat that would do the original band proud, along with the visual backdrop of a four-meter circle projecting video appropriate to each song played – the story of Pink Floyd would be told in a unique and creative way. As the night progressed, so did the intensity of the visual experience, delving deeper and deeper into the magnificent history of the band. Playing many of Pink Floyd’s hits such as ‘Another Brick in The Wall’, ‘Money’, ‘Wish You Were Here’ and many more, the audience satisfaction levels were high, producing long and loud applause after each song, even treated with a guest appearance during ‘Another Brick in The Wall’ from the kids at California Gully Primary School (one of Bendigo’s local primary schools) which garnered even more respect from the crowd. The night was a resounding success, the crowd paying homage to the dedication, commitment and preparation required to make the tribute of one of the greatest bands to ever exist work. Audio and visuals were absolutely on point (aside from a small feedback issue during ‘Wish You Were Here’) and if you weren’t lucky enough to witness Pink Floyd live, Echoes of Pink Floyd are your best bet at experiencing the master-work of the legendary band in this day and age.